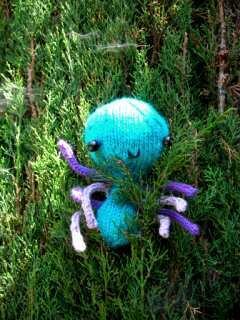 As promised in the tutorial, here is the Kumochan (little spider) knitted amigurumi pattern. Stuff body and head with polyfil or cotton batting. Join with mattress stitch. Using 2 small round black buttons (or safety eyes) sew eyes on side of head 2/3 from top). Embroider mouth and eyebrows. Attach legs to body. I’ve not been able to find very many free “knitted” Amigurumi patterns. I know just where I’m going to put this little guy! I know I have a million things I want to knit, but this is going to be a million and one. Actually, I’m going to start it as soon as I’m done with my current “big” project. That is so freakin’ cute! p.s . always looking for cat toys too!! cute Kumochan, and it’s knitted, too! just stopping by to introduce myself to you… i’m your knitter’s treat exchange partner. i’ll be sending you something good in the coming weeks! I am loving this spider and am making quick progress I just have a quick question. On the body Rnd19: k2tog, k3 6 times (24sts). Is this a typo? At this point you have 36 sts on the needles to go to 24 you would need to decrease by 12, all the other decreases are by 6. Should I be k2tog, k4 6 times (30)? and if so where do I go from there. I would love to get this finished up to see if my daughter likes playing with the toy as much as the wool and half knitted project. Thank you so much for sharing your creativity!